Santa Barbara has no shortage of Mexican restaurants. But since 1999, nobody has done it better than Tony Arroyo, who serves some of the freshest, healthiest, best-tasting Mexican food in town at his two eponymous restaurants, Los Arroyos Mexican Restaurant & Take Out. And he has another in Camarillo. Since opening in 1999, Tony has expanded the tiny (less than 600 square feet) original Figueroa Street location and added another in Montecito. 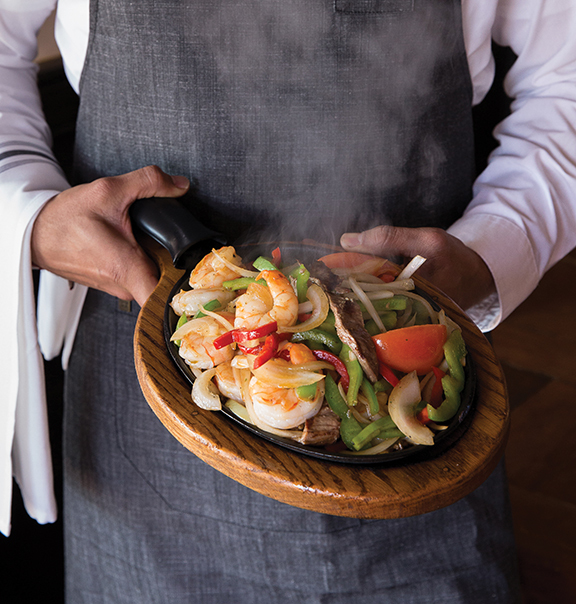 The original has counter service and table delivery; the Montecito site offers table service, plus a full bar with more than one hundred tequilas. Several things unite the restaurants: the always-warm welcome, a dedicated staff (some of whom have been there since the beginning and now work alongside their teenaged children), Tony’s attention to detail and his dedication to healthy, high-quality ingredients. Everything is made on the premises the day it’s served. The kitchen turns out ten homemade salsas each morning and rice is cooked up to five times a day to ensure freshness. Tortillas are handmade and tortilla chips cooked to order. Black Angus beef and free-range chicken are hand trimmed, cooked and shredded (or grilled) in the kitchen, where pasilla chilies are also carefully cooked, seeded and sliced. The staff roast and peel their own tomatoes. There are no shortcuts, and nothing is ever reheated. “It’s like my mother’s cooking, but from my hands,” says Tony, who grew up in the Mexican state of Michoacán, came to the U.S. by bus in 1984 and has spent the past thirty years perfecting his trade. “Our signature dish is quality,” Tony says. It shows up in his enchiladas, pozole, tacos, fajitas, chile rellenos, salads — everything. Wednesdays and Fridays are tamale days, but get there early because the eighty or so handmade tamales are gone by about 6 pm. On Christmas Eve last year, they set a record by preparing 1,700 special-order tamales for holiday celebrations at the homes of loyal customers. They say you can’t go home again. Los Arroyos may convince you otherwise.